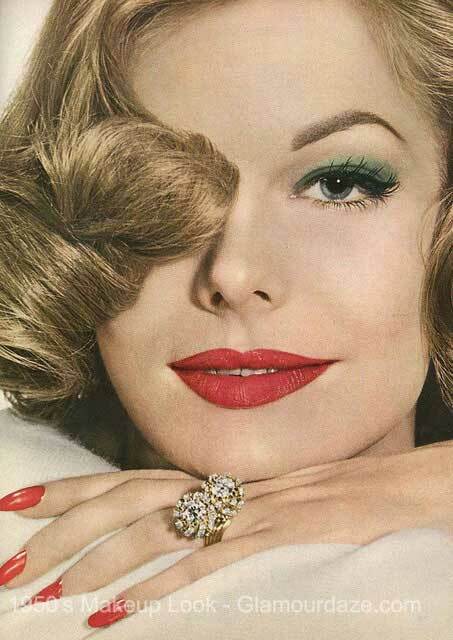 When you think of make-up styles from the 1950s, you think of Grace Kelly, Sophia Loren, Audrey Hepburn, Maureen O’Hara and numerous other Hollywood stars. Quite simply, these women were not only fashion icons but beauty icons for women around the world. 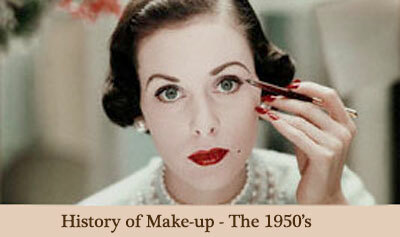 Their make-up looks defined the era, and it was without doubt the age of glamour ! 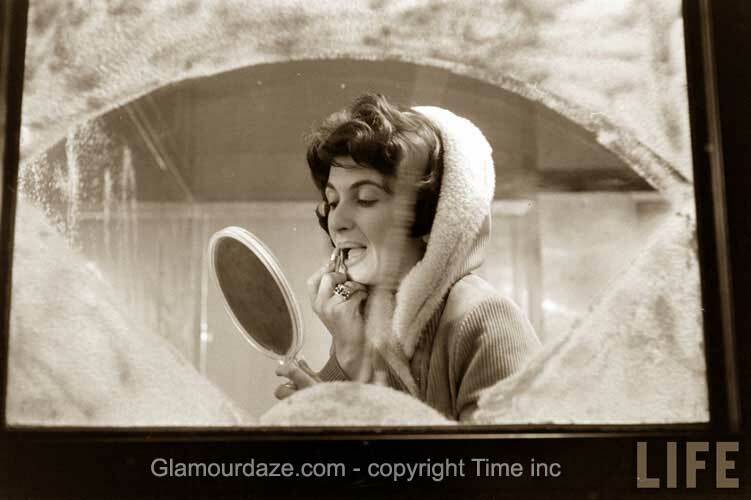 beauty salons and powder rooms became hallowed sanctuaries for glamorous women. 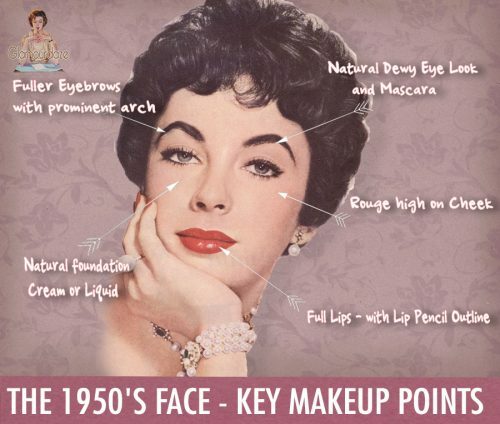 The 1950s Make-up Color Palette. Pastels ruled in this decade, pale pinks, greens, blues and yellows, and if ever there was a color that showcased an era, it was the color pink for the 1950s. Audrey Hepburn once claimed that she ‘ believed in pink ! ‘ Peaches and cream and pink hues all call to mind the 1950s, both in feminine decor, dress and make-up rouge. While Russian red was the favourite lip gloss color in the 1940s, it was pinks, purple-reds, and orange-reds which took centre stage in the early 1950s. beauty books of the era spent pages and pages advising women on what make-up to wear, for what times of the day, and with with which costumes. The art was known as Color Keying – which does not exactly drop off a woman’ s lips nowadays, unless she works with video editors ! Pale skin was back again, and pastel hues in powder. 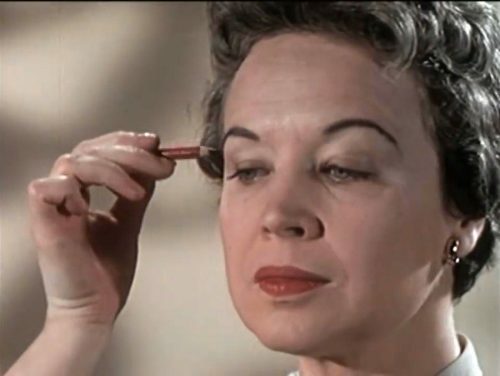 Delicacy was the goal for foundation creams and top names like Elizabeth Arden and Max Factor and Helena Rubinstein jostled for supremacy in a woman’s handbag. 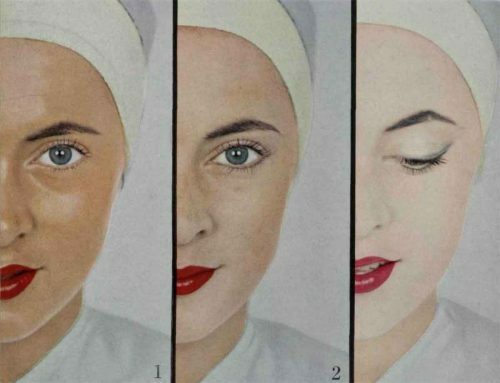 Unlike the 1940s, when a dab of powder was all that was available or affordable for a woman, now every day began with a foundation base, a mask like complexion – a blank canvas.You completed the look with peachy or flesh colored powder. 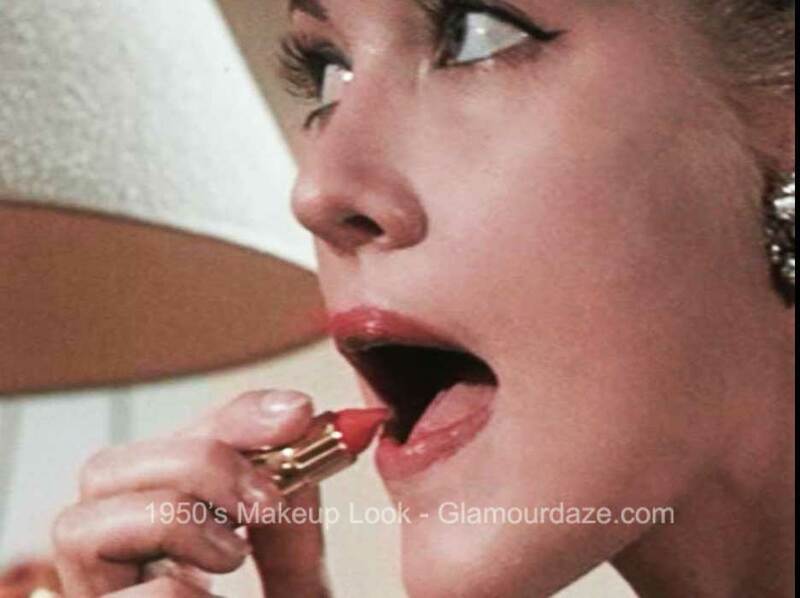 1950s Lipstick – Hazel Bishop. It was common now to extend the natural border of your mouth with liner, making a girls look more feminine and – well – voluptuous ! Pinks and Reds were the common mix. Orange-red lipsticks for blonde hair, redheads and other medium dark colors; and purple-red lipsticks for dark haired . 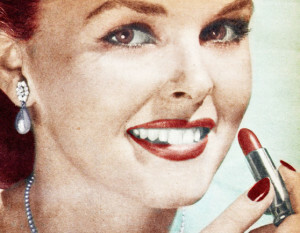 A survey in 1951 found that more than two thirds of women now regularly wore lipstick. 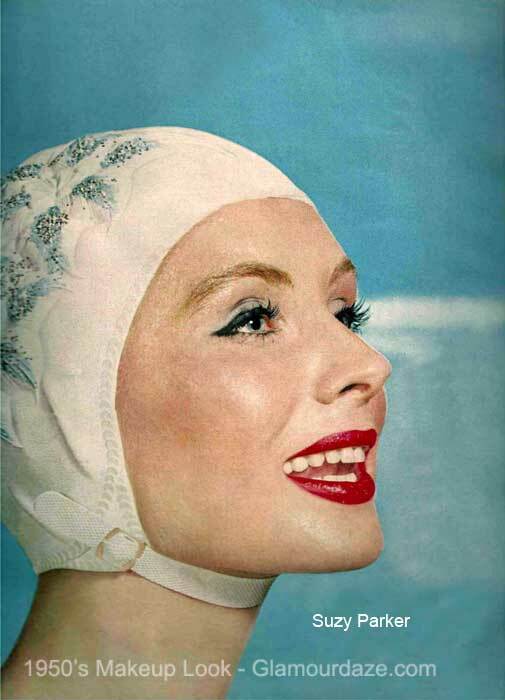 As a result – long lasting lipstick was the next goal, and the first kiss-proof stay-on lipstick was introduced by a lady called Hazel Bishop in 1950. 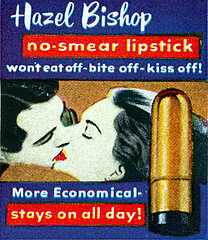 “It stays on YOU,” declared the ads for Hazel Bishop’s smudge-proof lipstick, “… not on Him!” It was so successful that she formed Hazel Bishop Inc the next year. 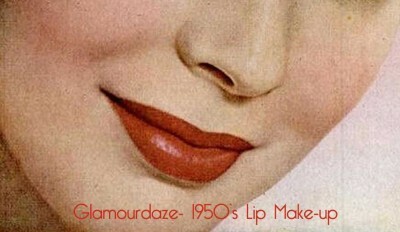 Sales of her lipsticks increased from $49,527 in 1950 to $10,100,682 in 1953 ! 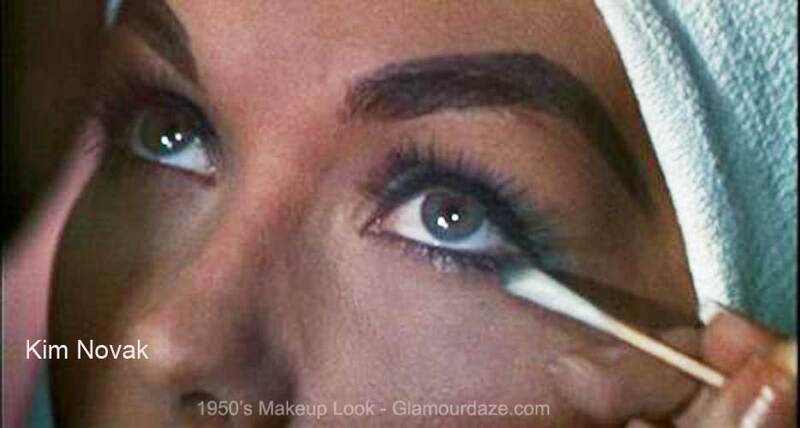 The eye look of the 1950s was essentially minimal, with little eye-shadow applied. Mascara on the other-hand was everyone’s favorite little accessory. Generous dabs of the stuff added a flushing femininity to a woman. A soft but definite liner was then applied along the upper lash and softly swept out in an arch, opening up the eyes. 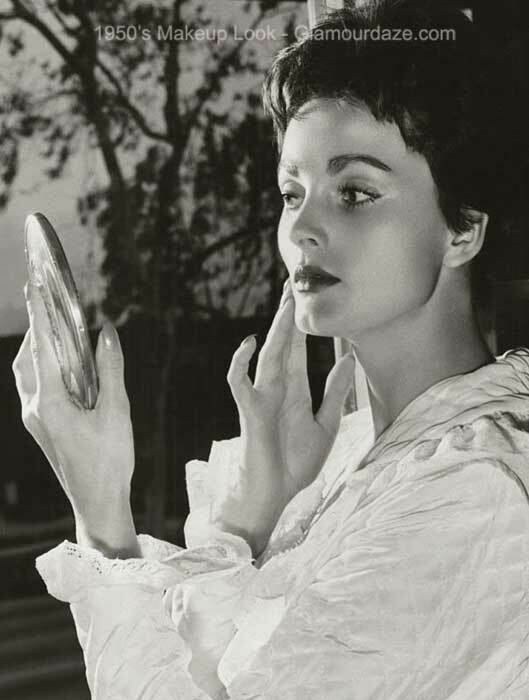 many women used their blush for an ever so light touch-up over the brows, in the evening time. Rosy and pastel hues of rouge applied to the apple of the cheek finished off the look. 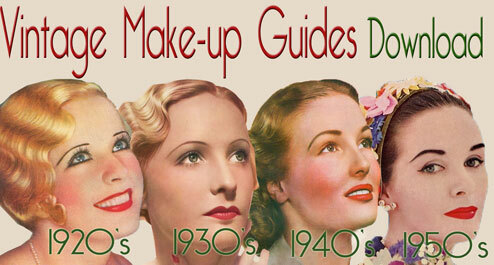 You can download direct to your smartphone, tablet or laptop, original vintage makeup tutorial books, lavishly illustrated. 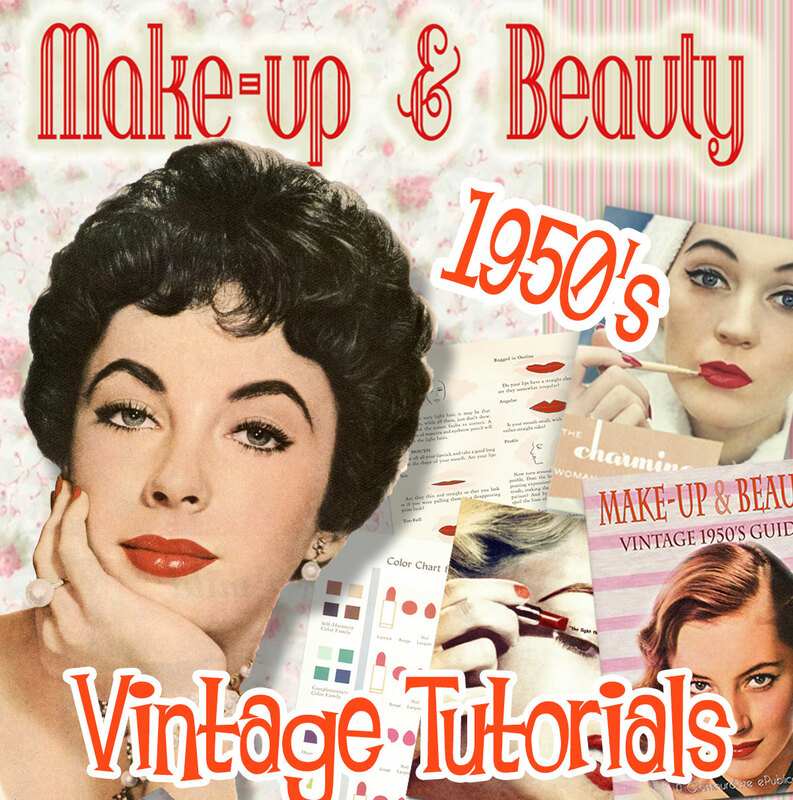 For a complete history of 1950s makeup and beauty, the key looks and loads of image galleries – visit our sister channel Glamourdaze. Click on banner below.